Plenty does happen, but generally this is a much more quiet day - The Monday webpage. SCROLL ALL THE WAY DOWN FOR MONDAY's WORKING PROGRAMME. John Tozer and Paul Lindley relax after Monday's lunch. ​Take a break with us. 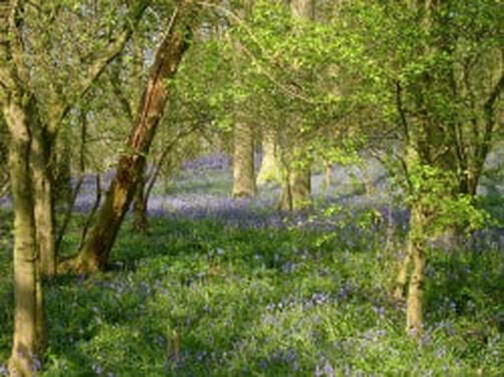 4) Back during cold Springtimes eg in 2010 '11 & 2013 - Bluebells were hardly to be seen during our event. (Nonetheless, Oversley Wood was unforgettably enchanting. A lovely April wildflower show. 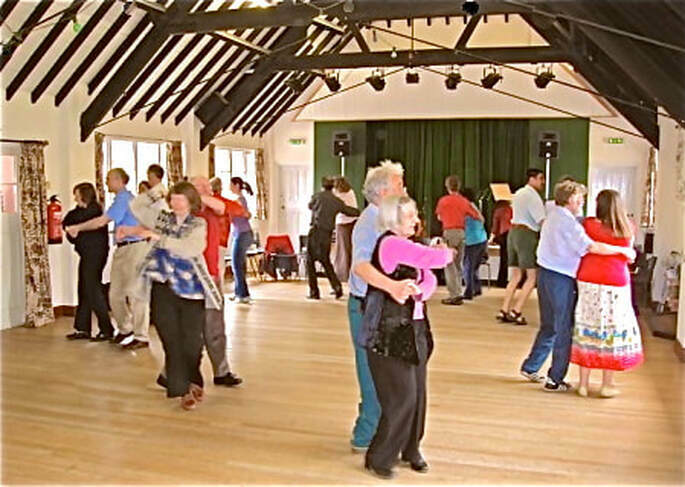 Partake on Monday 29th April; to look forward to a fully open bluebell spectacle. A Spring experience not to miss. The quieter Monday back when most timbers which once supported the hall's steep outer thatch could be seen. A small path through bluebells & stitchwort. Alas managed by covering this wildflower spectacle for some years with excessive piles of decaying brash which has buried the bulbs. Plan ahead, then you can share this day participating with us ! 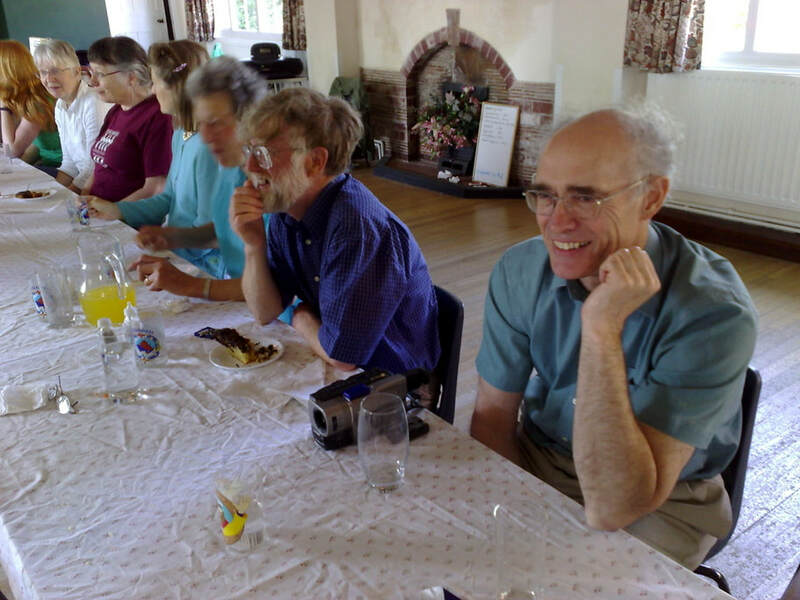 - A wonderful, special day with a relaxed chat over lunch. Take advantage of Monday as the BEST quiet day to really get to know Karin, Elsa and their dances. 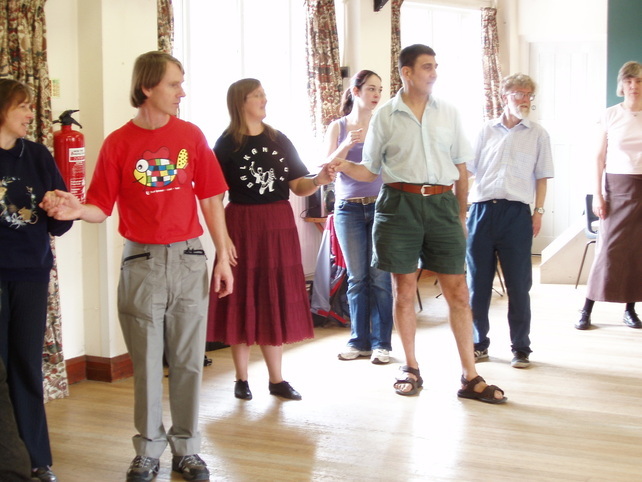 Peacefully enjoy on the Monday, WHAT WE DO - lots of varied dancing, handchimes, walking & more. DOWNLOAD - THE MONDAY WORKING PROGRAMME to see and/or carry on smartphone or print it - HERE . or Download direct: eg to Print at HERE above this display.